Before we get to the bread, I'm happy to announce that we have FINALLY published our text-only Recipe Index. You can browse by recipe type without having to go to Flickr and then return back to our site. It's SO MUCH EASIER to use . . . even WE're benefiting from being able to find our favorite recipes fast. Please be patient while we input the dietary information (mostly just noting if a recipe is vegan). However, it's important to note that all recipes are vegetarian. Most baked goods are vegan, even if their title doesn't suggest so. And in many of our recipes, we provide vegan substitutions if they aren't already free of dairy, etc. So, please check out the new Recipe Index (it's also in the tabs at the top of the page). And please let us know what you think. Bread baking is something I am planning to do a whole lot more of as I get more time after marathon training. I'm getting closer to perfecting the crust on crusty no-knead breads. The trick is truly waiting for 18 (or a full 24) hours before touching the dough. It's difficult to wait . . . but to help, I usually mix everything together before bed. That way, there's at least 8 hours where it's untouched. Then, I'm so busy getting ready for work in the morning that another 9 hours goes by . . . when I return home, I run . . . so, another hour. So, if you are as inpatient as I am, give my method a try. 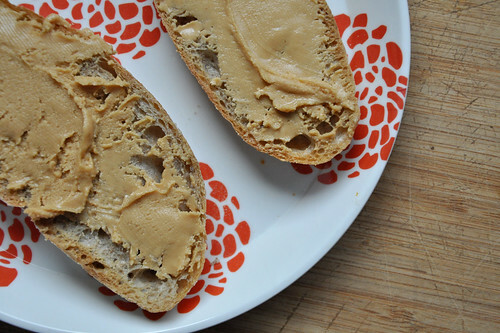 This recipe yields a large (or two small) white-whole wheat loaves perfect for anything from toasting in the morning to dunking into chili at night. I've had several people ask if a cast iron dutch oven is necessary. It's not, however you will need a covered pot of cast iron (or glass/Pyrex, etc.) to create the ideal hot and humid baking conditions. The conditions necessary for the best bakery-esque crust. 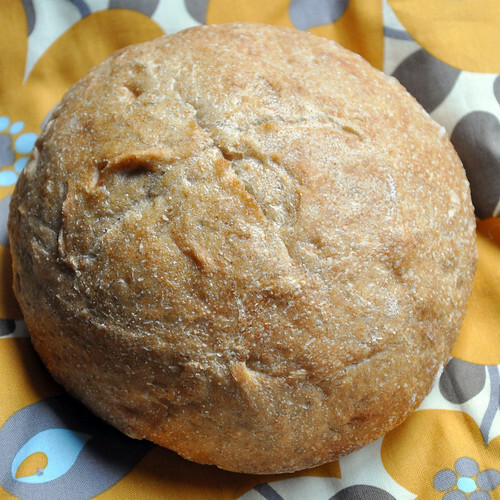 The dutch oven I have is pictured in the first no-knead recipe I posted back last winter. Mine is cast iron and actually a half the size of the the standard, but it works wonderfully. Use what you have. Consider investing later if you find you just love making bread. In a large bowl, dissolve the yeast in the warm water. I simply let mine sit for five minutes, then whisked lightly. Add in the flours and salt. Stir or lightly knead with you hands (though, the dough will be very sticky). Then, cover the bowl with a piece of plastic wrap and let rise for 18 to 24 hours. The longer the better. I put the bowl in our microwave and waited about 20 hours before going on. After you've finished waiting . . . lightly flour a clean work surface and scrape the dough out onto it. Gently knead and shape into a ball (if you're using a small dutch oven, you can divide the dough into 2 and shape into 2 balls -- that's what I did). Preheat your oven to 475 degrees F with you dutch oven in there, preheating as well. When it's ready, use you pot holders (one time, I honestly forgot an burned my hand!) to take the dutch oven out . . . and then toss in your loaf. Cover. Return to oven. And bake for 30 minutes. 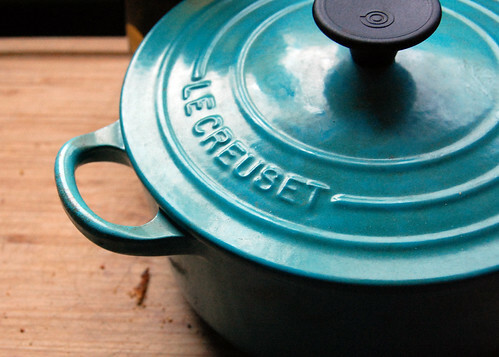 If you are using a smaller dutch oven and make two loaves, simply repeat this process. Let loaves cool on a wire rack. This bread is wonderful straight out of the oven. The crust is incredible. 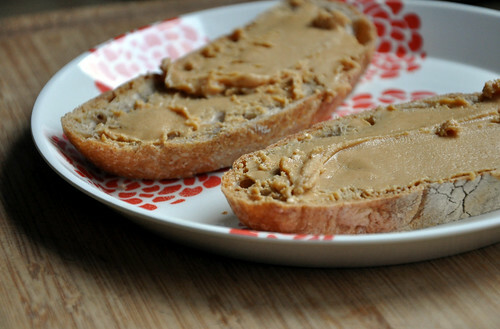 If you wait overnight, the crust will soften, but then get its crisp back if you toast it. 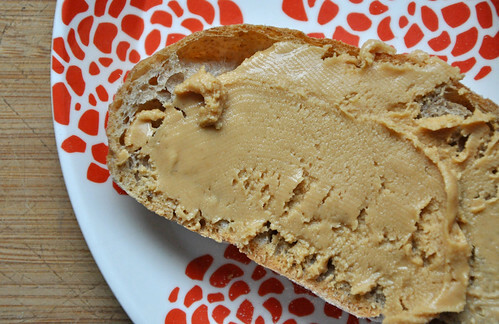 I recommend topping with some homemade peanut butter. 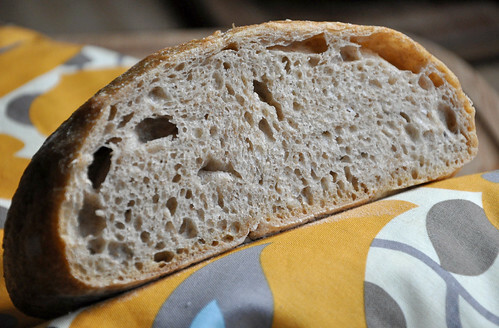 Have you ever baked a no-knead loaf? 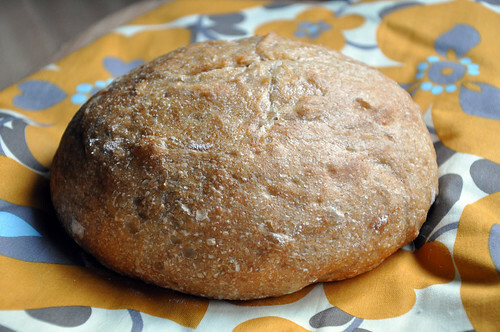 Or do you regularly bake your own breads? We'd love tips and/or your favorite recipes. Of all cooking/baking processes, making bread is my favorite. Not only because I love to eat bread, but also because I'm continually surprised by how my loaves turn out. Just leave a comment or email us at neverhomemaker [at] gmail [dot] com.